“Let your roots grow down into Christ, and draw up nourishment from Him. See that you go on growing in the Lord, and become strong and vigorous in the truth.” -- (Colossians 2: 7. LB). Did you know that you were created to become like Christ? Well, you were. However, each person has to first develop a relationship with Christ, and in order to do that they must first hear about Christ, then in belief ask Him into their heart, while choosing to live for Him. Only then can a person become more and more like Christ. We know that everyone is born with the ability to recognize God. At the time of conception, i.e. at their creation, God is with them throughout each person’s development. Then once a person is born, God is still there for them throughout all their days here on earth. As the Psalmist tells us: “You (God) made all the delicate, inner parts of my body and knit me together in my mother’s womb. Thank you for making me so wonderfully complex! Your workmanship is marvelous – and how well I know it. You watched me as I was being formed in utter seclusion, as I was woven together in the dark of the womb. You saw me before I was born. Every day of my life was recorded in your book. Every moment was laid out before a single day had passed.” -- (Psalm 139: 13-16. NLT). Throughout each person’s life God is there for them just waiting for them to acknowledge Him and His Son, because God wants to bestow upon them His endless love and constant protection. Even though every baby is born a sinner, before they become toddlers they can understand who God is. There is just something in their soul that recognizes and longs for a relationship with God. But as a child grows up in this world and faces the evilness within, the longing for a relationship with God can be pushed so far to the back of their minds that they no longer recognize God. However, they will continue to long for a relationship with God even though they don’t realize it consciously and don’t know Him. That is why so many young people, by the time they are in their early teens, are totally lost but yet they are still looking for something to fill that hole or void within their souls where God belongs. Many People Refuse to Believe in God. Many people did not have parents who introduced them to the Bible and God and they refuse to believe in God or Jesus Christ. Sadly, even some people who were raised with godly parents refuse to acknowledge God and His Son, Jesus Christ. These are people who are constantly searching for something, but at the same time refuse to see what is right in front of them. Little do they know, but there may come a time when God no longer pursues them to become one of His children, because eventually the Holy Spirit will quit calling out to them. The Apostle Paul explains these stubborn and sinful people’s situations this way: “God shows His anger from Heaven against all sinful, wicked people who push the truth away from themselves. For the truth about God is known to them instinctively. God has put the knowledge in their hearts. From the time the world was created, people have seen the earth and the sky and all that God made. They can clearly see His invisible qualities – His eternal power and divine nature. So, they have no excuse whatever for not knowing God.” -- (Romans 1: 18-20. NLT). Along with all people’s ability to recognize God as their Creator and Father, people have also been given the free will to choose to serve God or not. For, God will not force anyone to love, obey, or serve Him. Yet, with the ability to recognize the truth of God and His Son, Jesus Christ, many people will still not acknowledge or believe in Jesus Christ. However, those who do choose to recognize and believe in God and His Son, Jesus Christ, will be blessed in so many ways. In creating us individually, God has given each person a unique personality and special talents, gifts, and insights that can be used in serving Him and in serving and caring for others. Unfortunately, because we live in a fallen world that constantly presents problems, trials, and difficult matters or situations to us in many different ways, all these things when taken individually or together can then affect our lives in a either a positive or negative way, depending on each person’s specific personality and intellect and the way they handle the matters in life. In addition, some people’s personalities are more prone to participating in the evil things of this world. Moreover, some people just cannot contemplate the goodness of God, because their minds only think about simple things or only things that are right in front of them, as they are presented with the negativity of this world that they encounter. Others are simply unwilling to look at God’s creation or are unwilling to contemplate His power, love, and divineness. We can choose the path that we take. There are many other matters or situations that can impact a person’s life in such a way that it will override a person’s innate knowledge of who God is. Sadly, these matters, events, or situations can range anywhere from physical and emotional abuse by family, strangers, or even so-called friends to events or matters that are subtle, unexpected, or hurtful. So, whether or not a particular person can handle a negative situation or event in their life depends upon the character of that person and the depth of their faith and trust in God. In fact, how a person perceives, thinks upon, and views everything in life ultimately depends on their personality, their ability to think things through, as well as how they look at the world around them, and how they choose to handle each and every situation; all of which will then determine their willingness or not to pursue having a greater relationship with God. There are also people who, because of their circumstances or because of their pridefulness, or their desire to accumulate power along with their willingness to accept unfounded philosophical ideas of their own or of others’ making, will actually defy goodness, truth, honesty, love, consideration, or kindness toward others. In addition, they may even lack principles, values, and ethics as well as integrity and honesty. Usually, these are very unhappy people. But, in such cases, God knew even before they were born that it would take some type of momentous event to get their attention, but even at that God knew that many of these people would still refuse to believe in Him and His Son. These individuals would simply refuse to see things differently or change the way that they perceived the world. They do not think upon their own, use common sense, or search for answers that God has ready if they would just ask. Instead, they succumb to group think, selfishness, and the desire to be their own god. However, God also knew that some people that He created would willingly choose to look at life through the eyes of goodness, kindness, caring, and love. These individuals, like Abraham, would search for the truth and find God. God knew that still other people would be able to see Him within all He had created and seek Him out. Indeed, it would be these people who could be saved from their sins and saved from the sins of this fallen world. But in order to Save them, God would have to sacrifice His Only Son. Because, it would take the blood of Christ to wash away their sins and make them righteous before God. However, each person would still have to make a personal decision for Christ in order to have their sins forgiven and in order to be made righteous before God. This means that everyone who hears the Gospel message or who sees God and His Son in all Creation will have the opportunity to believe in Christ as the risen Son of God and will have the opportunity to repent of their sins. God has given us the ability to become more like Christ. “God knew what He was doing from the very beginning. He decided from the outset to shape the lives of those who love Him along the lines as the life of His Son. The Son stands first in the line of humanity He restored. We see the original and intended shape our lives there in Him.” -- (Romans 8: 29. The Message.). In fact, “Christ is the visible image of the invisible God. He existed before God made anything at all and is supreme over all creation. Christ is the one through whom God created everything in Heaven and earth. He made the things we can see and the things we can’t see – kings, kingdom, rulers, and authorities. Everything has been created through Him and for Him. He existed before everything else began, and He holds all creation together.” -- (Colossians 1: 15-17. NLT). Actually, from the beginning even before the world was created, God’s plan for humankind was to make them like His Son, Jesus Christ. We know this, because at the time of creation, the Trinity of God, i.e., the Father, the Son, and the Holy Spirit said, “… Let us make people in our own image, to be like ourselves. … So God created people in His own image; God patterned them after Himself; male and female He created them.” -- (Genesis 1: 26, 27. NLT). Obviously, we were not created to look like God or to be God. Rather, we were created to reflect the glory of God through the lives that we live for Him. It is God’s character and the character of Jesus Christ, His Son, that we are to reflect back to God and to reflect upon others who do not yet know or have a relationship with Him. So, what characteristics are we to reflect back to God and upon others? Well, part of God’s character and the character of His Son is reflected in our love, patience, kindness, faithfulness, truthfulness, forgiveness, and integrity as we interact with other people. For, God, the Trinity, has all these characteristics and so much more. Well we must start with understanding what our new birth in Christ should look like. This means then that we have to understand what the full “image and likeness” of God is and what it means. The full “image and likeness” of God looks like Jesus Christ! For the Bible tells us that “[Jesus Christ is] the exact likeness of God.” – (II Corinthians 4: 4. NLT). Scripture also tells us that “Christ is the visible image of the invisible God. He existed before God made anything at all and is supreme over all creation. Christ is the one through whom God created everything in Heaven and earth.” -- (Colossians 1: 15. NLT.). We are also told in the book of Hebrews that “The Son reflects God’s own glory, and everything about Him represents God exactly.” -- (Hebrews 1:3. NLT). With our own Salvation through Jesus Christ, the Son, we are given the opportunity to reflect the nature and goodness of Christ to the rest of the world. If we become more and more like Christ, we, too, can then give God glory and honor as we represent the glory of the Son in the things that we do. But in order to do this, Scripture tells the Saved person that with your Salvation you must “… throw off your old evil nature and your former way of life, which is rotten through and through, full of lust and deception. Instead, there must be a spiritual renewal of your thoughts and attitudes. You must display a new nature because you are a new person, created in God’s likeness – righteous, holy, and true.” -- (Ephesians 4: 22-23. NLT). So, in order to become more like Christ, we must turn in a new direction with our life. We must allow the Holy Spirit to guide and direct us in all that we do. This means that we must make a conscious determination to commit our daily living to representing Christ in all that we do. We have to care about right and wrong and want to do what is always right in the eyes of God. We have to clear our minds of the darkness of this world and focus on the truth and righteousness of Heaven. In other words, we have to work at becoming a more godly person every day. With our re-birth and with our pursuit into the likeness of Christ, we must “put away all falsehood and ‘tell y[our] neighbor the truth,’ because we belong to each other.” – (Ephesians 4: 25. NLT). The Apostle Paul gave this verse to the Ephesians, because God does not want Christians to lie. God does not lie. Moreover, “Lying lips are an abomination to the Lord.” -- (Proverbs 12: 22. NASB). We are also not to let anger, which is a worldly emotion, get the best of us. For, anger is not representative of Christ. In fact, Jesus said, “But I say, if you are angry with someone, you are subject to judgment! If you call someone and idiot, you are in danger of being brought before the high council. And if you curse someone, you are in danger of the fires of hell.” -- (Matthew 5: 22. NLT). Christlikeness means, too, that those who are Saved are to “begin using y[our] hands for honest work, and then give generously to others in need. Don’t use foul or abusive language. Let everything you say be good and helpful, so that your words will be an encouragement to those who hear them. And do not bring sorrow upon the Holy Spirit by the way you live. … Get rid of all bitterness, rage, anger, harsh words, and slander, as well as all types of malicious behavior. Instead, be kind, to each other, tenderhearted, forgiving, one another, just as Christ has forgiven you.” -- (Ephesians 4:26-32. NLT). We are not to try to become a god. But God does want us to become godly, and in so doing, become more like Christ so that we can represent Christ to the rest of the world. Becoming godly means that we take on the values, attitudes, and character of Jesus Christ. We are to “Take on an entirely new way of life – a God-fashioned life, a life renewed from the inside and working itself into your conduct as God accurately reproduces His character in you.” -- (Ephesians 4: 22. The Message). However, in order to live a godly life and be renewed from the inside out, we must listen to the Holy Spirit who indwells all truly born-again Christians. For, “as the Spirit of the Lord works within us, we become more and more like Him and reflect His glory even more.” -- (II Corinthians 3: 18. NLT). And, if we listen to the Holy Spirit and do the will of the Lord within our lives, we will become more and more like Christ. In fact, all born-again Christians have been given the desire to obey God through our Salvation and the indwelling of the Holy Spirit. But, to become more and more like Christ, we have to do more than just desire to become more like Him. We have to train ourselves to constantly think about developing and acquiring the characteristics and attitude of Christ. And we need to read and try to obey the Word of God. Only then can we become more like Christ which will then be seen by others within our behaviors, words, actions, and within our service to Christ and the Heavenly Father. This service will be displayed through our kindness and loving actions toward others. Every day people will be able to see that there is something different about those individuals who are becoming more and more like Jesus Christ; as they display kindness, caring, and love toward others. People will see their good behaviors, actions and words. People will also see the joy and smiles upon the faces of truly born-again Christians who are reflecting the love and goodness of God and Christ out upon their little part of the world. These Christians will also show the characteristics and attitudes of Christ when they reach out in service to others. Indeed, our service to God and others can in many different ways be seen as not only a reflection of our love for God, but also as a reflection of the acquisition of the characteristics of Christ. In other words, people can see that we are living for Christ in all that we do. Our Christian life then becomes a way of sharing the Gospel message which will then open the door for the Good News to be shared. Active Relational Christian Mentoring is just one of the many ways that we can show the world that we are emulating the actions, attitudes, and characteristics of Christ within our own life. Have you reached out to mentor and help another woman? Have you shared your love of Christ with another person? Can others see Christ in you? If you want to learn more about the service of Christian mentoring and the importance of becoming more and more like Christ, please check out my book: The Three-Stand Cord of Active Relational Christian Mentoring. You can purchase the book from Amazon, Christian Faith Publishing, or Barnes and Nobel. The following is a link to Amazon. Accepting Christ as Your Savior. Accepting Christ as your Savior, or giving your life to Christ is so simple. All you have to do is believe on Jesus Christ as the risen one and only Son of God. But, you need to understand that you are a sinner, for we are all born sinners. “For all have sinned, all fall short of God’s glorious standard.” – (Romans 3: 23). You also need to understand that we must pay for our sins. In fact, the Bible tells us that “the wages (payment) of sin is death (eternal death).” – (Romans 6: 23). Yet, with our belief in Jesus Christ and with the repentance of and the turning away from sins, “God in His gracious kindness declares us not guilty.” – (Romans 3: 24). God did this through the sacrifice of His Son, Jesus Christ whose blood takes away our sins. “For God sent Jesus to take the punishment for our sins and to satisfy God’s anger against us. We are made right with God when we believe that Jesus shed His blood, sacrificing His life for us.” -- (Romans: 3: 25.). God loves you so much that He sent His Son to earth to die for your sins. But the grave could not contain Him, for three days later Jesus Christ arose from the grave conquering eternal death. 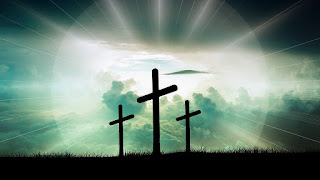 Christ's sacrifice on the cross is that payment for our sins that will give all who believe on Christ as the risen Lord the right to eternal life with God and Christ. If you believe that Jesus Christ died and arose from the grave and that He is now back in Heaven preparing a place for you, then you have been Saved. All you have to do now, is to tell someone that you have repented of your sins and have accepted Christ as your Savior, and that Christ is now truly living within your heart. Congratulations! You are a child of God’s.